Johnny Rowland, a popular figure in the Gun World and host of a shooting show developed 460 Rowland ammunition as well as the caliber itself. Rowland designed the cartridge in 1998 in conjunction with both brass companies and custom weapons companies. The cartridge was intended to be used in 45 caliber handguns, specifically the 1911 platform. .460 Rowland ammo’s purpose was to have a cartridge stronger cartridge capable of withstanding a higher maximum cartridge pressure over the 45 ACP and the 45 Super. The 460 Rowland is capable of obtaining faster velocities and more foot pounds of power than the 45 ACP. The 45 ACP can fire a 230 grain FMJ load at 830 feet per second, the 460 Rowland fire a 230 grain round at 1,340 feet per second. The 460 Rowland features a long case than standard a standard 45 ACP cartridge, but features an identical overall length to the 45 ACP. The longer case of 460 Rowland ammunition prevents it from mistakenly being loaded into a 45 ACP weapon, which could prove disastrous due to the Rowland’s higher pressures. 460 Rowland conversion kits can be found for Glock 21 Pistols, Springfield XD and XDm pistols, and the SIG P220. 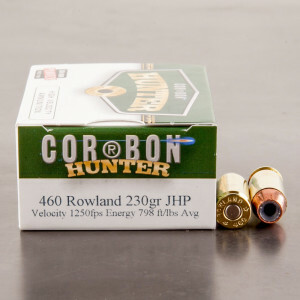 The 460 Rowland is best utilized with a compensated pistol and is an excellent hunting cartridge for those desiring an autoloading pistol in a compact package for hunting. I like this ammo, it shoots well. it's a good round.